After doing a really fun Dutch oven demo for a good friend and his friends, I got excited again. It’s actually been a while since I’ve done Dutch oven in my own backyard. Between that fun demo, and my newest book, I’m getting stoked to start doing it with regularity again! This recipe was really easy. We had some extra frozen chicken breasts, and I thought I’d use them up. I did a quick google search for recipe ideas, and one came up for a Balsamic Vinegar marinade. Well, that sounded yummy, so I tweaked it up based on what I had on hand, dressed it up with some veggies and asparagus, and here it is! So, the night before I made the marinade. I put the liquids into a zip-top baggie and mixed them up. I wanted to onioniness to permeate the flavors, so I thought first of dicing it. But then, I peeled it, halved it and used a cheese grater on it. It turned into a very liquidy mush and it helped get the flavors into the chicken. Then, I added the spices and flavorings and the chicken and mixed it all up. I shook and massaged the bag to make sure that all of the chicken was well covered. When it was time to cook the next day, I started by lighting up the coals. While those were getting white-edged, I cut up the peppers, potatoes, and onions. When I do onions in chunks, I cut them in half, and then quarter each half. That makes nice wedges that are big enough to help lift the chicken above the bottom of the Dutch oven, but small enough to bite. I tried to make the potato pieces a similar size. Assembling this dish for cooking is very simple. I tossed the veggies into the bottom of the pot and stirred them up just a bit. Then, I opened the bag of the marinaded chicken and layered those pieces on top of the veggies. Finally, I topped the lid and put it on the coals. It cooks pretty quickly. I think that within about 40 minutes it was ready. 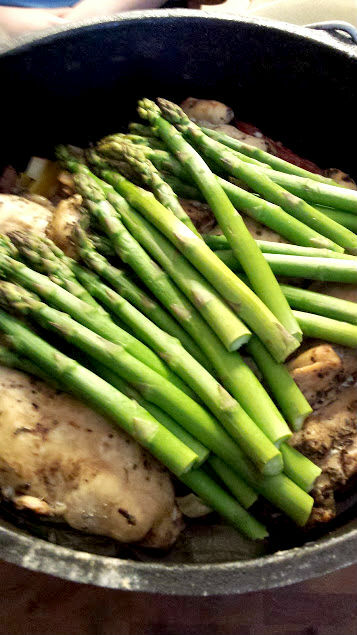 At about 30 minutes or so, I snapped off the stringy ends of the asparagus and tossed them in on top of the chicken. The idea is to just let them steam and get that nice, rich, green color, and enhance the flavor. They should still be crunchy when they’re done. If you grab one by the end and hold it level, it shouldn’t droop. If it does, it’s been cooked too long. Serve 1-2 of the breasts with the cooked veggies on one side and 3-4 asparagus sprigs on the other. It’s a beautiful, impressive, and delicious dish! This food looks tasty. Gonna try this on my new ovennow. Thanks a lot!